Eggs from UEP Certified farms are marked with a seal, an assurance that hens are raised under rigorous standards for care. In 2002, United Egg Producers established the first UEP Certified guidelines – standards for hen well-being backed by decades of research and recommendations from an independent Scientific Advisory Committee. Today, more than 85 percent of eggs produced in the U.S. come from farms that voluntarily participate in UEP Certified, choosing to open their farms to independent auditors. With periodic updates to account for new research and continuous improvement, UEP Certified is an acknowledged leader in science-based guidelines on hen well-being. UEP Certified has been endorsed by the Food Marketing Institute (association of retail grocers) and the National Council of Chain Restaurants (association of fast food restaurants). 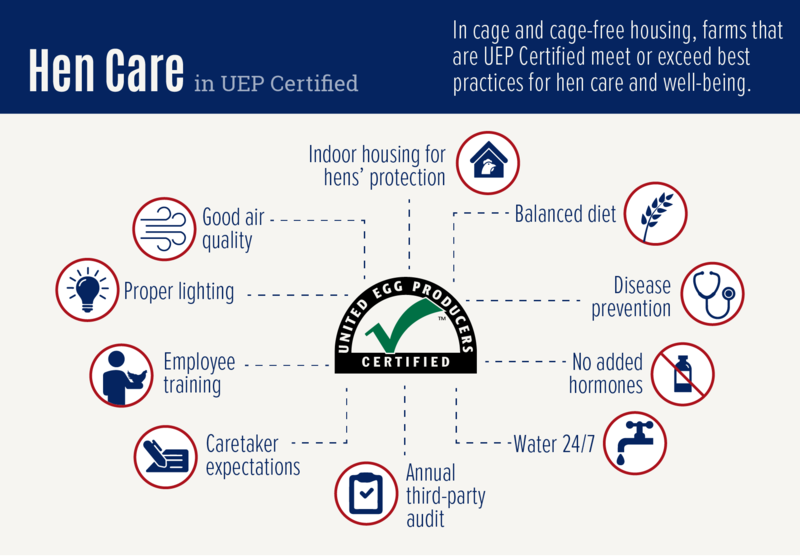 UEP Certified provides standards for hens housed in conventional cage and cage-free housing. In 2006, the first UEP Certified cage-free guidelines were established, following the conventional housing guidelines initiated in 2002. 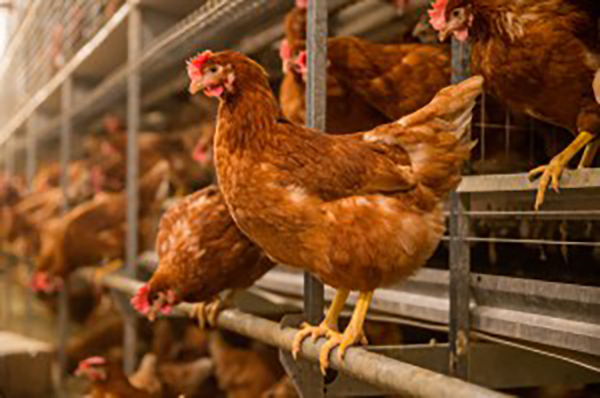 Egg farmers know excellent hen care can be provided in various housing options, and UEP supports all methods of hen housing, when they assure proper hen well-being and meet or exceed all food safety requirements. These systems often keep the hens indoors, which protects flocks from extreme weather and predators. Indoor housing also prevents exposure to migratory waterfowl, which may carry diseases harmful to hens and aids in the prevention of other diseases. Modern hen housing ensures the health and well-being of hens and allows for proper flock management, while also ensuring a safe, fresh, affordable supply of eggs for consumers. Nearly 20 years ago, in 1999, UEP convened an independent, unpaid Scientific Advisory Committee to evaluate well-being standards for egg-laying hens, review existing research, conduct new research and recommend improvements for egg farms. The first recommendations from this advisory committee became the foundation for UEP Certified. The advisory committee continues today and provides an ongoing review of new research and modern egg farm standards, which is utilized for continuous improvement of the UEP Certified program.